Expect plenty of trickery and sleight of hand in The Great Gambini’s Night Magic. Created by Novomatic, this 5 reel, 20 payline video slot comes with plenty of extras including 4 base game modifiers that turn losing spins into winners. There’s also a feature that awards free spins complete with expanding symbols that can copy onto the reels to the left. Play on your PC, tablet or mobile device from between 20p and £100 per spin. The designers at Novomatic have upped their game over recent months and this is another impressive looking game. With a cobbled street scene in the background, you’ll find the usual lower value royal values as well as bottles of potion, a pocket watch and a book of spells. The treasure chest is the most rewarding symbol, offering payouts of 20 times your total bet if you land a 5-in-a-row combination. Gambini’s top hat is the wild. This substitutes for all other symbols apart from the free spins scatter and also offers payouts of up to 25 times your total bet per payline. Guillotine feature – when the blade drops onto the reels, it reveals a winning combination. You can land multiple wins here from the same trigger or even enter the Free Spins feature. Levitation feature – Gambini levitates a random assortment of symbols from the reels and drops new ones in to replace them. A winning combination is then created. Reel Magic feature – Gambini shuffles the reels to transform a losing configuration into a winner. You could see multiple shuffles here if you’re lucky. Quick Change feature – with a wave of his wand, Gambini can shift 1 or more symbols into new winning positions. 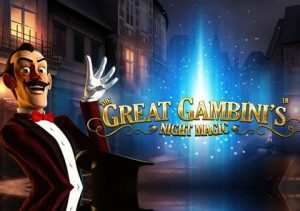 The Great Gambini’s Night Magic also comes with a Free Spins feature that’s triggered by landing 3, 4 or 5 free spin scatters on the same spin. On offer are 5, 10 or 15 free spins. During the feature, the middle reel gains some magical properties. 1 symbol is chosen at random on each free spin. If the chosen symbol lands on the middle reel, it expands to fill the whole of that reel. All of the symbol positions on the reels to the left are also filled with the same matching symbol to create a potentially large block of symbols and a payout to match. Gambini can turn reels 4 or 5 into magic reels too. The same process applies. If a chosen symbol lands there, it expands and copies onto all the reels to the left to create even bigger combinations. If he’s feeling generous, Gambini can also add extra free spins to your total on your final free spin. This magic show is an enjoyable one, combining some quality design with a nice range of extras. As far as volatility goes, we’re in the medium range with top wins of 1,000 times your bet on every spin/free spin. Novomatic has created an enjoyable video slot here. If you like the conjuring theme, then you’ll certainly want a ticket to The Great Gambini’s Night Magic. If you want higher variance, Novomatic has plenty of options with Dragon’s Deep my favourite.